As high school freshmen, students familiarize themselves with a new school, new people and a new environment, often nervous and excited to start a new chapter of their lives. DSHA seniors experienced a similar feeling a few weeks ago, embarking on a new service journey called Vocare. Vocare, the Latin word for “to draw forth” or “to call,” is the capstone of each student’s four years of service. Each student serves two full weeks in the greater Milwaukee community, serving children, elderly or those with special needs. In fact, it was such a good experience, neither Florence nor Ellise Little, DSHA ’19, who was also assigned to the memory care, assisting living and independent living community, wanted to return to their regular routines after two weeks. Their new normal during their two weeks of service included playing music, leading exercises or stretches, playing cards or coloring with the residents in the morning. Their afternoons always included an activity, like Bingo or giving manicures to the ladies or painting. During the two weeks Little and Florence were serving, one of the residents celebrated her 100th birthday, and they planned a big birthday bash for her. Most importantly, they were tasked with making connections with the residents. Meeting and connecting with residents forced the two students to slow down and think about the needs of others before the needs of their own, they said. Whether or not they sit in silence or have an opportunity to engage with residents, the students change the environment of the facility with their presence. Little and Florence were able to relate their experience with the memory residents to their own lives and their own grandparents. Although Florence doesn’t see her grandparents on a regular basis, they are healthy, and she is grateful for their health. What struck her was the age of some of the residents. She found out that one of the residents is younger than her own parents. Working with memory patients, both Florence and Little came face-to-face with dementia and those living with Alzheimer’s. At the memory care at Gables of Germantown, there’s a wide spectrum of Alzheimer’s residents, said Florence. Some are in great spirits, and others experience depression. Little heard residents asking when their parents will come to see them, when many of their parents have passed on. Florence was surprised to find that, out of all the details the residents have forgotten, they still remember the lyrics to their favorite childhood songs. Rodriguez noted that the students’ experience of working with Alzheimer’s residents is going to help them in their future. Both Florence and Little have learned and grown throughout the two weeks of service. While they could have easily been placed in schools — which they thought would be an “easier” placement— during Vocare, they are grateful to have connected with the elderly. To learn more about service at DSHA, visit https://www.dsha.info/page/faith-formation/service. 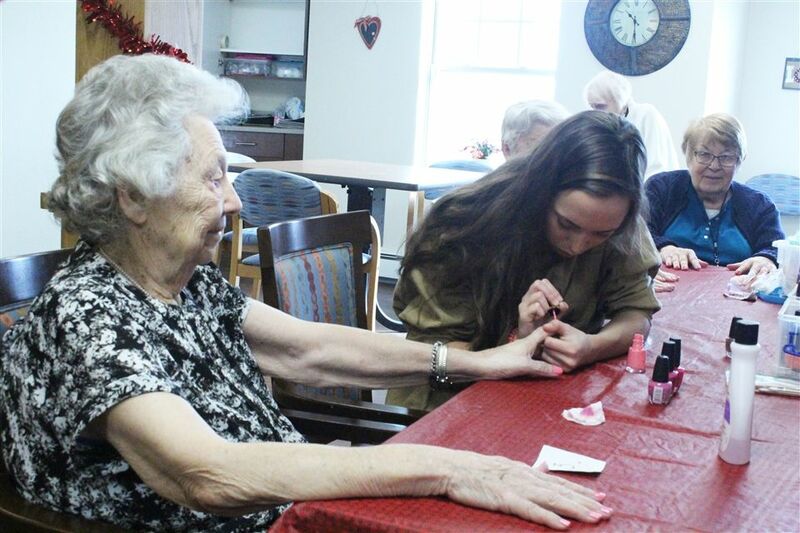 Jane Florence, DSHA ’19, paints the nails of elderly ladies at the assisted living center at Gables of Germantown. 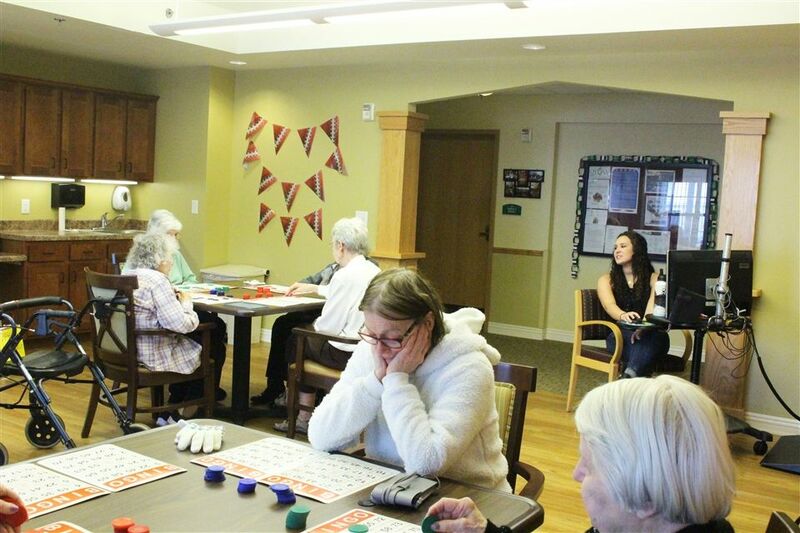 Ellise Little, DSHA ’19, calls Bingo for the memory care residents at Gables of Germantown.